This gorgeous New England farmhouse is a family treasure. After the passing of her beloved uncle Bob, Jamie and her family took the chance and moved into his stunning home. 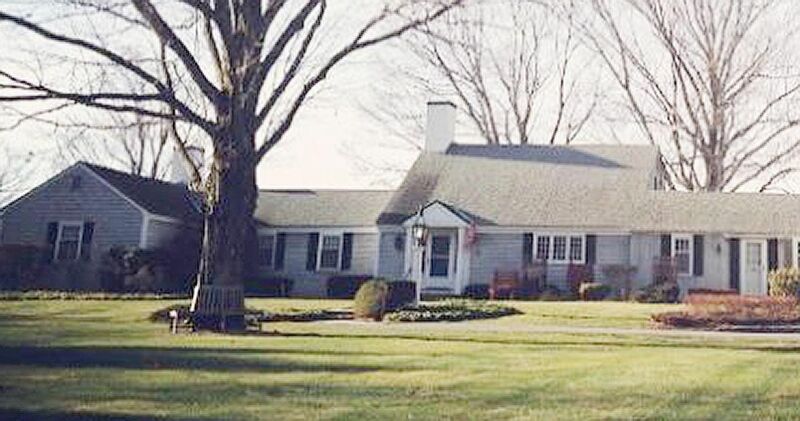 For many years prior, the home and yard were beautifully maintained by members of Jamie's extended family. Upon moving into this generational retreat, Jamie ventured to add her own touches to the home while respecting the memory of her uncle and his design choices. The bright blue cabinets were painted a crisp white and the island was moved to create additional space for a kitchen table. The wallpaper in the guest bedroom is staying, for now, and has been creatively incorporated into the decor of the room. Thankfully, the bones of the home, with its established paneling, hardwood floors, and exterior design, are effortless to work with. These elements provide the backdrop for a sea of soothing blues, grays and whites and furniture and decor with that rustic appeal. This gorgeous floral wallpaper sets the tone for the home as you enter through the front door. A passageway connecting the kitchen and living room features deep navy walls offset by crisp white trim and warm wood floors. This open concept room showcases a soothing color palette of blue and white that creates cohesion between the kitchen and living room. Multiple coats of white paint transformed this bright blue kitchen into a crisp, white country space. This airy family rooms is comfortable and toddler-friendly with its upholstered ottoman and slipcovered sectional. Just off the kitchen, this tiny set of table and chairs provides the ideal spot for an impromptu tea party. The built-ins seen throughout the home continue into the master bedroom where they create a relaxing reading nook. The deep blue of the walls in the master bedroom adds an element of drama in the otherwise light and bright space. Once again, the combination of blue, cream and white in this space is simply stunning. This spacious sunroom provides additional living space for fair-weather parties and family get-togethers. Instead of removing the wallpaper in the guest bedroom, Jamie cleverly worked around it by incorporating lots of white textiles coupled with a few rustic wood elements. If you enjoyed the rustic charm of this New England home, share this article with your friends on Facebook.